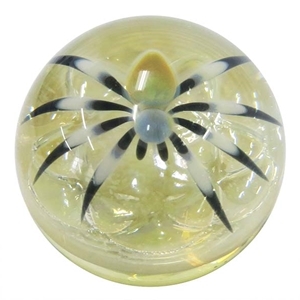 MoonMarble.com - Florin Voicu - "Tarantula Marble on Ivory"
Art Glass → Contemporary Handmade Marbles → Florin Voicu - "Tarantula Marble on Ivory"
Handmade contemporary marble by Florin Voicu. This marble is a compression style marble featuring a expertly crafted spider with a fuzzy grey body and black legs. The spider hovers over a glowing ivory background. Approximately 1 3/4" in diameter.